Seas W12CY001 E0021 Woofer. £133.50 excl. VAT. 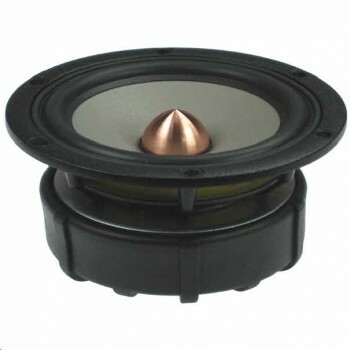 Famous 12cm 4.5" woofer/midrange, precision magnesium cone, natural rubber surround. Superb bass and midrange detail. Seas W12CY001 E0021 Woofer/Midrange is the famous12cm 4.5" cone Excel Series woofer/midrange unit, with a stiff light precision cast and surface treated magnesium cone coupled to a natural rubber surround showing no sign of edge resonances and giving superb bass and midrange detail. Heavy copper rings mounted above and below the T-shaped pole piece reduce non linear and modulation distortion and increase overload margin. Copper plated top and bottom plates and a solid copper phase plug enhance the performance of the copper rings and improve heat conduction away from the pole piece. An extra large magnet system is used for good sensitivity and transient response.